I don't know about you, but the past couple months have been so incredibly hectic, I've hardly had time to shop for necessities. It's these times where I love subscription boxes that include natural products I can use in my daily routine. This month's BelloCrate is filled with seasonally appropriate products that I'll be enjoying all winter long! Thanks to natural beauty boxes, I'm discovering more deodorants that are safe and better for my skin than what I typically find at the drugstore. This deodorant has a fresh citrus scent that's not over-powering which is really nice. It's surprisingly light-weight and not greasy at all. It is free of parabens, phthalates, aluminum, and is vegan and cruelty-free. When deodorants come in a jar, the application takes some getting used to. For this deodorant you simply warm a bit between your fingers and apply. It's not as convenient as a stick of deodorant but you get used to it. I like that this deodorant also has shea butter and vitamin E to hydrate and care for the skin as it does its job. This brand has an entire range of unique, good-for-you products. Not only do they make soaps, but they also have a multitude of products in the form of a bar that are great for traveling. They have shampoo, conditioner, and lotion bars too. The soaps come in a range of scents including Vanilla Wisp and Chocolate Fudge (yum). The soap included in this month's BelloCrate is Citrus Twist which has a great fresh scent that I think would appeal to both men and women. It contains mango butter (which is a Beauty Puff favorite!) and olive oil for intense hydration and nourishment. What I also thought was interesting, is that the coloring is naturally derived from things such as annatto seed, eggplant leaf, and even basil! 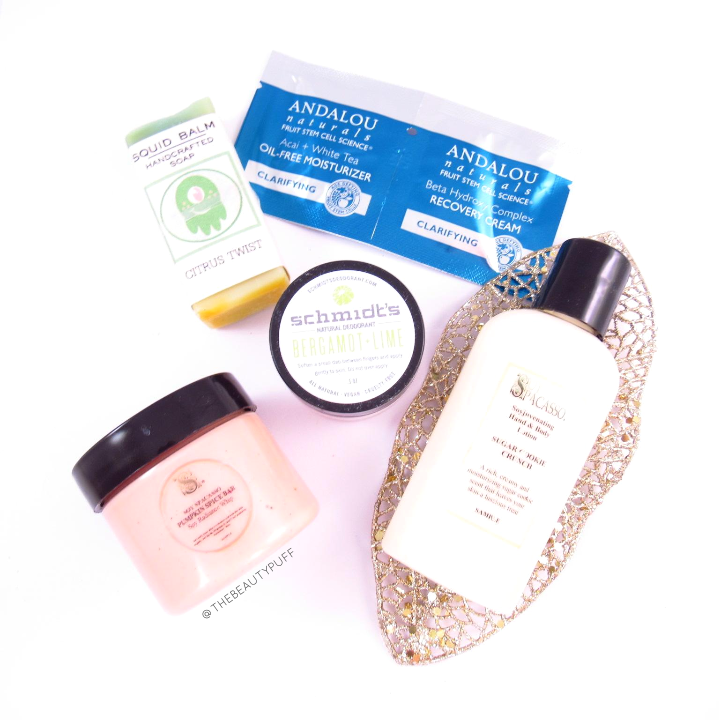 Last month BelloCrate introduced me to Andalou and I really liked the sample of the Perfecting Cream by this brand. This month they've included two more skincare samples - the Recovery Cream and Oil-Free Moisturizer. The Recovery Cream is geared toward oily skin so I was excited to see that. This cream minimizes pores, balances oil, calms and evens tone - all things I need. The moisturizer is suitable for all skin types but says that it mattifies which is ideal for me. It is antiseptic, anti-inflammatory, nourishing and helps protect skin from free radicals. I'm excited to see how my skin responds to these products because I really think this is a brand I'll end up delving into more. The formula of this moisturizer really surprised me because although it is rather thin in consistency, it feels very rich and hydrating on the skin. It absorbs quickly and doesn't leave any greasy residue so I can enjoy it any time of day. I absolutely love the Pumpkin Spice scent, it's so warm and inviting! This Radiance Whip comes in so many decedent scents I don't know how you would choose - Candy Cane Swirl, Chocolate Raspberry Truffle, Cinnamon Toast, Peppermint Patty Treat... need I go on?? This is definitely my favorite item included this month, I never would have found this if not for BelloCrate. Just when I thought the decadence was over, BelloCrate included another treat from Soy Spacasso - their hand and body lotion in Sugar Cookie Crunch. These lotions come in the same irresistible scents as the Radiance Whip - so just choose your formula! This lotion does a whole lot more than moisturize - it regenerates, helps lighten dark spots and evens skin's tone. This lotion comes in a bottle as opposed to a jar, like the Radiance Whip. This may be the more travel-friendly option if you plan to throw it in your purse this winter.